Dirty Dancing is one of the most successful and loved films of all time, with both an Academy Award and Grammy to its name. It is only natural that writer Eleanor Bergstein would want to adapt the classic story for the stage, bringing the show to millions of happy audience members. The story is a classic coming of age tale as 17-year-old Frances “Baby” Houseman embarks on a family vacation to the New York Catskill Mountains where she develops a crush on resort dance instructor, Johnny Castle. Baby becomes privy to a private, late night dance party where she becomes enthralled by the raunchy dance moves performed by Johnny and his dance partner Penny. Baby begins to take dance lessons from the hunky Johnny and becomes involved in the lives of the resort staff; particularly Penny who has a pretty big problem on her hands…As Baby tries to help others in need her feelings for Johnny develop. As the plot thickens it becomes very clear that this is the vacation where Baby becomes a woman. 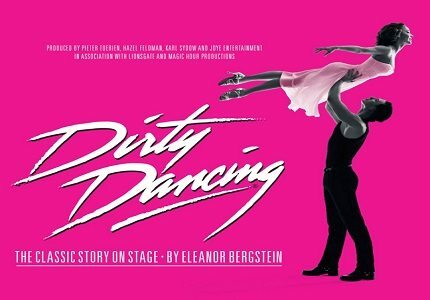 Dirty Dancing: The Classic Story on Stage first hit the West End in 2006 and successfully ran for five years before heading out on an equally fruitful tour of the UK and Ireland. The show returns to the West End, this time at the Piccadilly Theatre, in a blaze of glory with audience members itching to revel in the classic love story. Like the film, the onstage event contains the classic hit songs “(I’ve Had) The Time of My Life,” “Do You Love Me,” “Hungry Eyes,” and “Hey Baby” as well as some new songs to delight the audiences ears. Of course alongside the music comes some excellent choreography as the audience can see the true meaning of “dirty dancing” for themselves as they watch events unfold on stage. The show contains adult themes so is not suitable for younger children. Older children (14+) may see the show accompanied by an adult.